Researchers in Toronto and British Columbia have discovered something that a lot of Toronto cyclists have found out the hard way: Streetcar tracks can be a serious hazard to your health. Researchers in Toronto and British Columbia have discovered something that many cyclists have found out the hard way: streetcar tracks can be a hazard to your health. 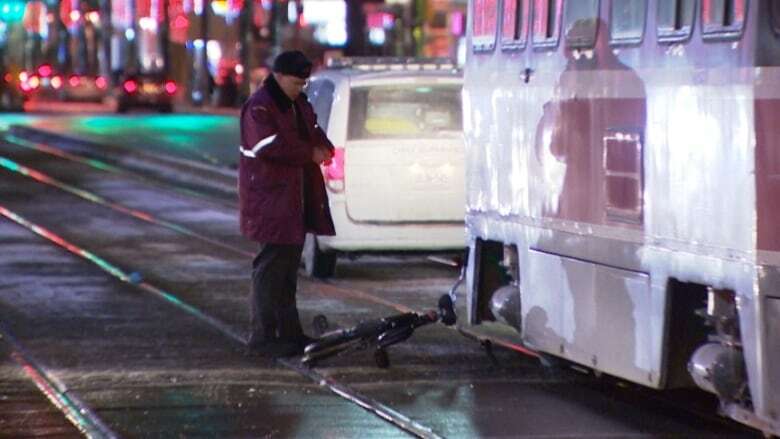 The study, by researchers at Ryerson University and the University of British Columbia, found that about a third of all serious bike crashes that took place in downtown Toronto were caused by streetcar tracks. "We're hoping that putting some numbers [against this] will help set priorities," says Anne Harris, one of the study's co-authors. 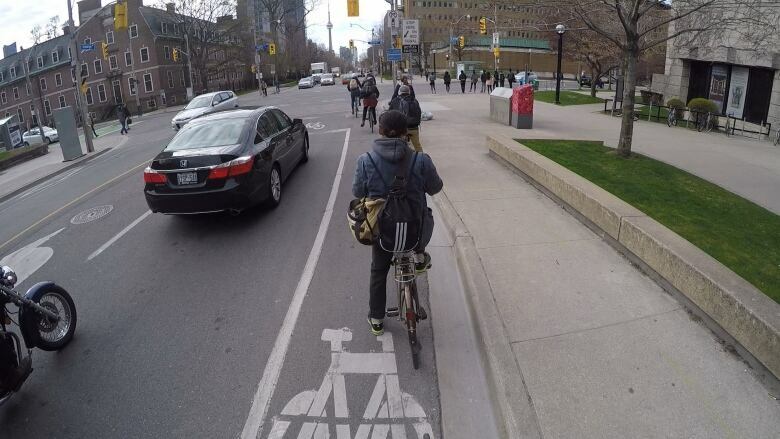 Speaking to Here and Now's Gill Deacon, Harris explained that while there are some measures cyclists can take to protect themselves, infrastructure changes — and especially building separated bike lanes — is the best remedy. The study, published last week in the journal BMC Public Health, looked at 276 bike crashes that happened in Toronto's downtown core between May 2008 and November 2009 and were serious enough to require hospitalization. Researchers found that 87 of those spills happened after the cyclists' tires either became caught in the tracks, or skidded across them. They said the crashes happened most often on streets that contained parked cars and which had no bike lanes. "Training and attention, these are all good things to advocate for, but one good thing that really offers protection is physical protection ... a separated bike lane," Harris says. The study's authors say they hope the findings will spur urban designers to create more of those lanes, and as well as light rail networks with their own rights-of-way, which also reduce the number of accidents. "Cyclists who are injured on these tracks reported circumstances like having to maneuver around other road users," Harris explains. That maneuver​ing means that bike riders often get caught in the flangeways — the openings through which streetcars roll through the tracks. Cyclists turning left were also at a high risk of streetcar track-related accidents, the study found. Intersections can be "a real spaghetti of tracks," says Harris, "which can make it really difficult to cross at the recommended 90 degree angle." Aside from building more separated bike lanes and rail systems with their own rights-of-way, the researchers recommend that cyclists be encouraged to use bikes with wider tires. Most bikes on the road today have tires that are "still narrower than the narrowest point on that flangeway," Harris says. But that may not be enough, according to Ross Lyle, head mechanic at Toronto's Bikes on Wheels. "People think a big fat tire is going to be okay. A streetcar track is way wider than you think and it'll accept anything," he told CBC's Ali Chiasson. "So there's really no bike that's better for it." His safety advice? "It's really just about paying attention."